A hot tub leak can become an extremely frustrating problem, as leaks (especially small ones) are quite hard to locate. And of course, the leak isn’t getting fixed if you can’t find it. Here are some basic troubleshooting steps for how to locate your leak and fix it. Note: Not all of these materials will be needed. This list mostly makes up the various hot tub components that may need replacing in order to stop your leak. The pump is one of the most common places for a leak. Turn off the power and check under the pump for leaking water. If water is leaking, you may need to replace either the pump itself or the pump seal. The next thing to check is union fittings located around the pump and heater, as they can come loose rather easily. Even on new hot tubs, there is a chance that they’ll vibrate loose in shipment. If the union fittings are loose, tighten them by hand. Never tighten spa unions with a wrench! The next thing to check is the heater assembly manifold, consisting of the heater, pressure switch, and other surrounding components. Replace any parts necessary to fix a leak here. Inspect all valves for leaks. On knife style valves, which have two halves bolted together, there is a gasket in between which can fail and cause leakage. Also, some hot tubs have valves installed on either side of the pump so that water doesn’t need to be shut off or drained in order to replace or fix the pump. However, these are actually a very common cause for leaks, and are often removed entirely after the first issue with leaking. Move on to checking all pipes, jets, and connections for leaks. Some connections can be tightened or sealed, while leaking jets have a failing gasket inside that will need replacing. In the case of PVC type pipes that have cracks or holes, use a product called Plast-Aid to fix them. This is a molecular bonding component that actually hardens stronger than the PVC itself. Modern shells are made from such strong fiberglass combined with other layers that if there is a shell leak, it is actually a problem with one of the jets or other attaching components. If you do have a shell leak though, Plast-Aid can be used to fix it. If a visual inspection of all the components doesn’t turn up a leak, there are a few other methods. For example, if the leak is substantial but for some reason you can’t find it, try putting small amounts of dark colored dye (food coloring will work) in the water and watch where it leaks to. This also works if there is a leak but the area around your hot tub is constantly wet from other factors; look for the puddle distinguished by the dye. 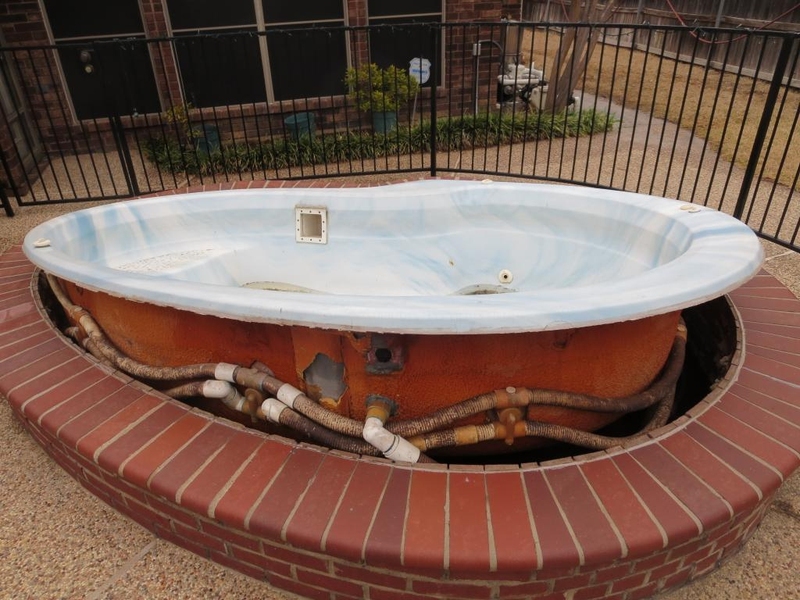 As a last ditch method, let your hot tub continue to drain without refilling it. At least once a day, mark the level of the water. Once the water stops leaking, you know that the level is just below the leak. Server responsed at: 04/22/2019 12:53 a.m.